Our furnace has not worked for years. Some of the furnaces in big motor homes take 15 amps of DC power. While ours is smaller at 7 amps; it is still a lot of battery power to run all night long and is just not a practical thing to run on solar power unless you can spend a lot of money on it. We use a propane heater without a fan instead, which actually uses half the propane that a furnace would. Those furnaces are very inefficient; great for heating the great outdoors but not so good at keeping the heat inside. Of course we keep a vent open when we have it on (common sense). Yes, burning propane produces a lot of water vapor plus carbon dioxide but adequate venting takes care of it without reducing the efficiency to anywhere as low as the average RV furnace. IMHO, the best heater is the Empire ceramic tile or “brick”. These are made in the US. I believe all the others are Chinese, but some are prettier than the Empire (and of course cheaper). In particular the Legacy was pretty (no longer available), but I think you need to balance that with quality and what sending our dollars to China is doing to our economy. The portable base for an Empire is steel and stable, while the base for the others is a couple of wimpy pieces of plastic. (One of our friends knocked their Legacy over and the tiles broke.) The grill is chrome plated, not a painted piece of expanded metal that will rust. These are radiant heaters like a catalytic but you can get them with a thermostat, something lacking on the Olympian catalytic. 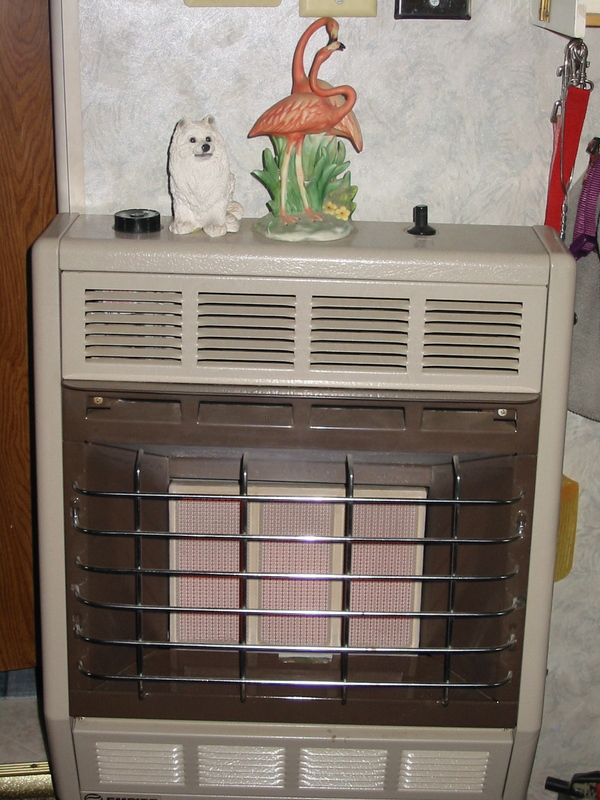 The only time I had a problem with an Empire heater the factory air expressed a new pilot & thermo-couple assembly to me at no charge without a proof of purchase, just a phone conversation. This is a good company. We had a smaller 10,000 BTU single brick one in our first trailer back in 2000. We bought a second one & found it wasn’t enough for our bigger & leaky fifth wheel. We now use the bigger 18,000 BTU 3 brick unit with a thermostat. It is now 7 or 8 years old, it works perfectly and we love it. We know somebody who prefers the three brick without the thermostat because you can switch it so that you have one, two or three bricks lit. He claims it is nicer to have even heat, not the on & off of all the heat at once that the thermostat does. We like the thermostat so that we can leave it on low at night, keeping us at about 50 degrees. I wish they made it with both features, I have been thinking about doing some modifying. We’re not dead yet, so don’t believe those people who tell you that it is dangerous to leave a heater going at night. Right now in Montana this heater is going 24/7. The warning page that comes with the catalytic heater convinced us to never buy a second one when the first failed after only 2 years. According to the factory, pet hair & dust both corrupt the pads. I quote what they said when I complained: “You don’t keep it covered?” Egad no…. We use it!